Last week we had cold and snow all over Sweden, even here in the south, where winter more often than not mean a damp and chilly wind that quickly seeps into your very bones in a way that dry, frozen cold don’t. 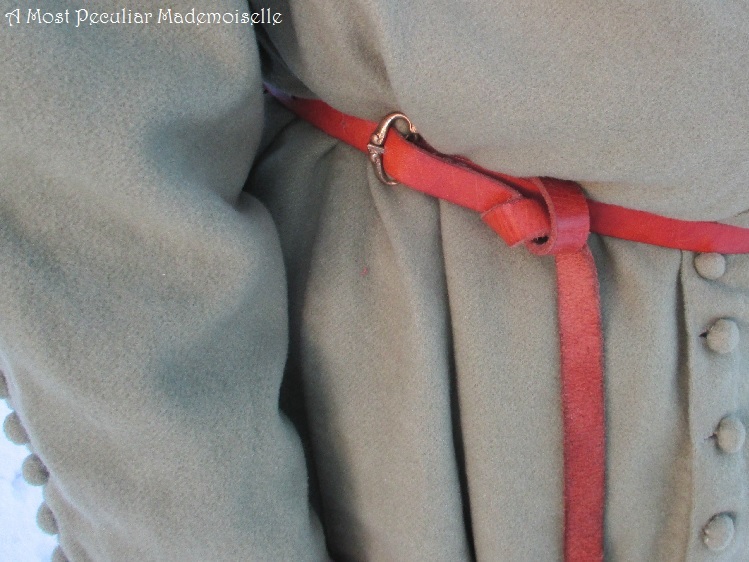 It was perfect weather for taking pictures of your historical winter clothes, if you had them. 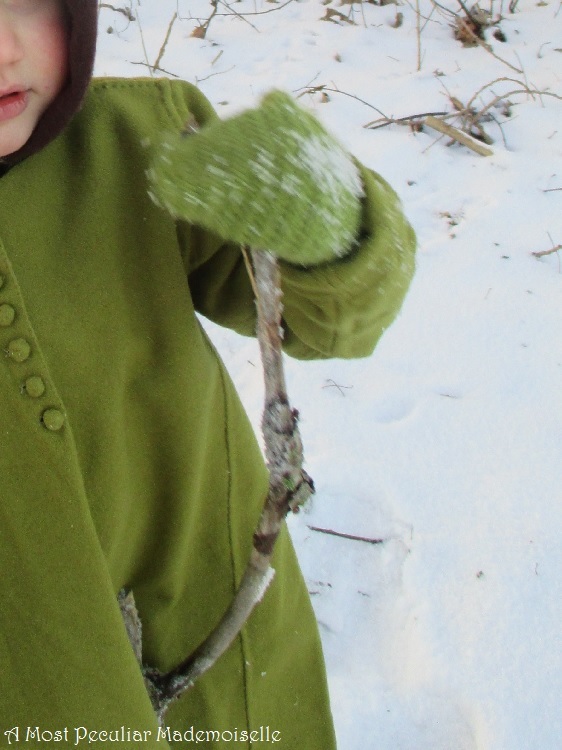 I didn’t, but I never got good pictures of the green kyrtilI made for Tobias a few years ago. When he got dressed our four year old said he wanted clothes like that too when we went out. I hadn’t planned for that, not wanting to force my hobby on him more than necessary, but I’m not one to say no when he requests it himself. 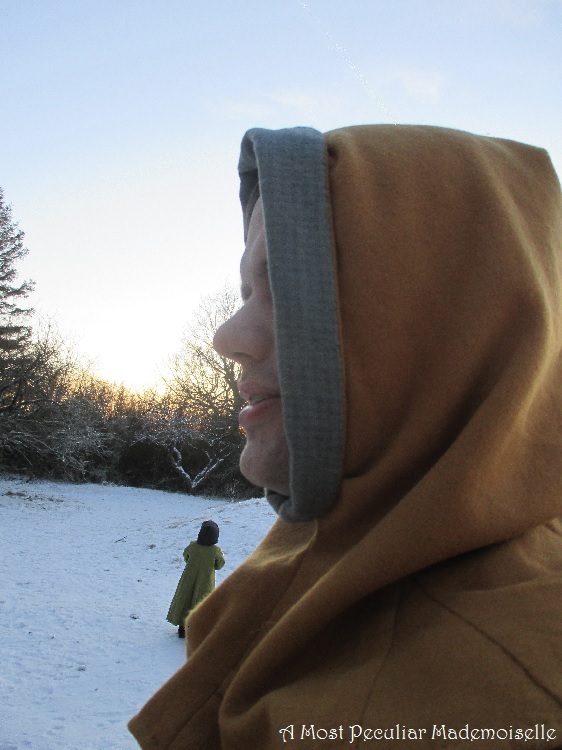 Wearing two wool kyrtils, a buttoned wool hood, woollen nalbound socks and mittens (really little brother’s socks) he was ready to face winter with his dad. We don’t have all that much in the way of medieval looking nature where we live, so we had to make do with what little there is: a small copse and a corner of the playground. Tobias commented that there were a lot of green in their clothes – and there is too much, really. 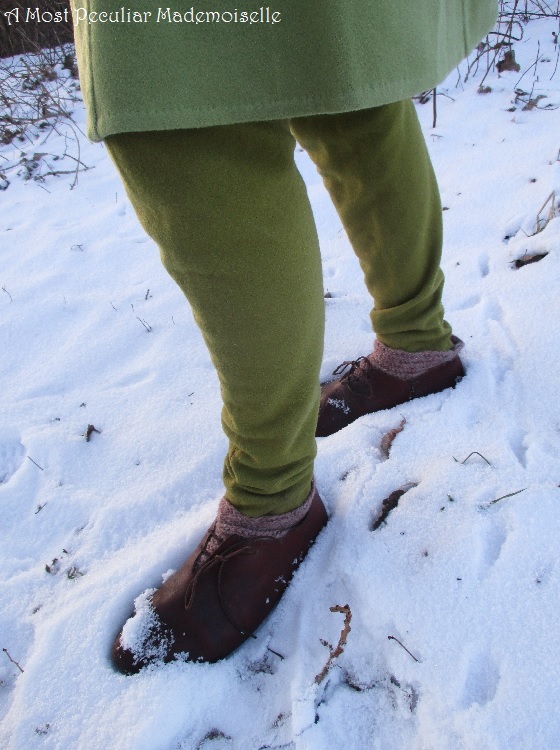 The child’s kyrtil is made from the leftover fabric from his hose, and that his buttoned kyrtil is also green is just bad luck. 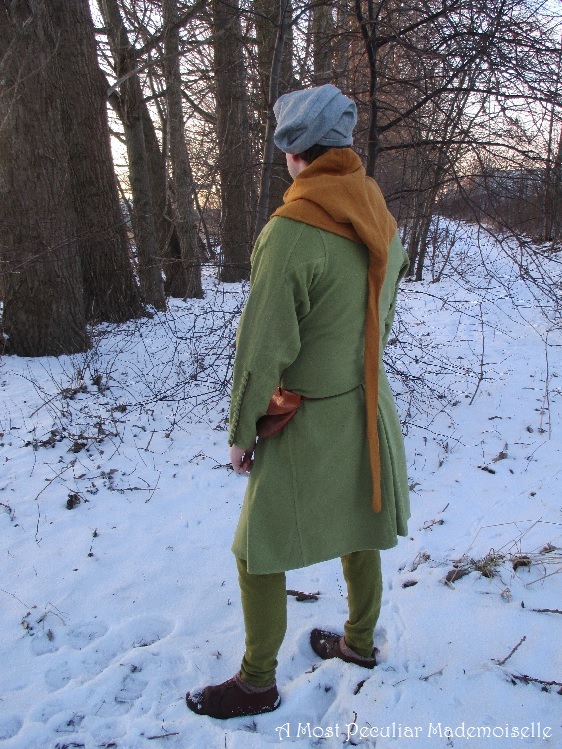 He wore two kyrtils, a pair of hose with nalbound socks over them, a hood and a cap, all in wool. A belt, purse and shoes were the finishing touches. 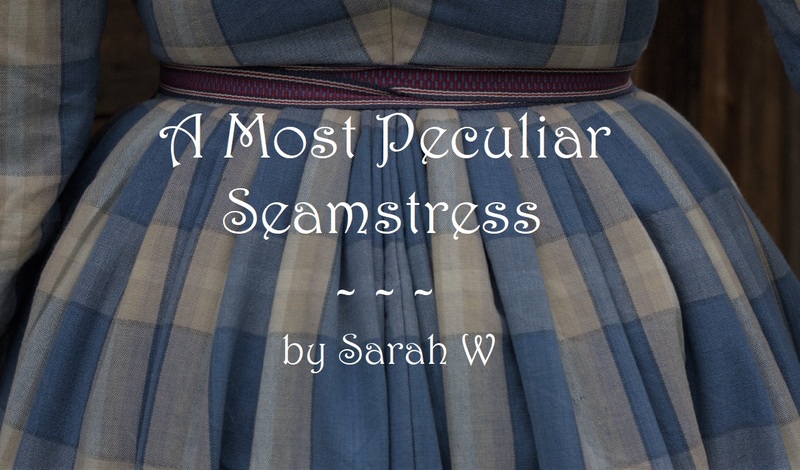 It’s interesting how clothes you were very proud of when you made them looks a bit meh a few years later, when you’ve deepened your knowledge and raised your own standards. I’d really want to make Tobias a whole new wardrobe, but time and money is a factor as always, so it will have to happen little by little. None of it is bad; I just have higher demands on our stuff now, and likely will have again in a few years. It’s the good and bad of this hobby. After a quick photoshoot and some sledding for the children, we went home. The snow is gone now, and today it almost feels like spring, even if that is still several weeks away. Hopefully we’ll be able to attend a weekend event or two this summer. We’d also love to go to the 25 year anniversary of Middelaldercentret, so fingers crossed that it works out! Beautiful work!!! And the photos turned out great, really like looking at a medieval painting. 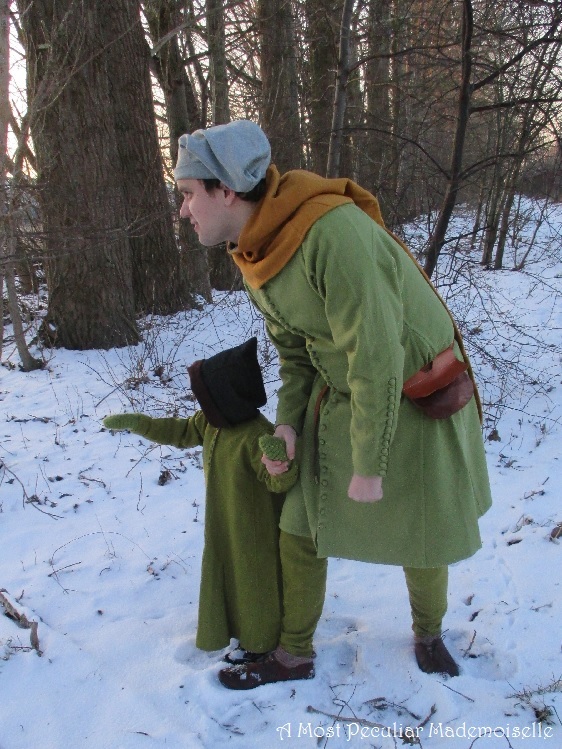 I, being not too knowledgeable in mediaeval clothing, am very curious what you would like to update about these clothes. If you're interested in writing about it. Maybe that's not the best purpose for this blog, though, and perhaps I should look elsewhere for information. Nonetheless, I am interested.